After another weekend of a stuck weather pattern and more rain for the North East, parts became overwhelmed with water. Various people were stranded including a bride. Rescues were carried out from rooftops to cars. Emergency official are saying this is worse and has damaged more buildings than the previous flood three weeks ago. Schuylkill and Columbia counties have had numerous reports of over six inches of rain. At one point 150 rafters were missing but have since been accounted for. Published on Aug 13, 2018Millions of people on the East Coast are threatened by dangerous weather. Heavy rain has already triggered flash flooding in parts of New Jersey and Pennsylvania. Don Dahler reports. 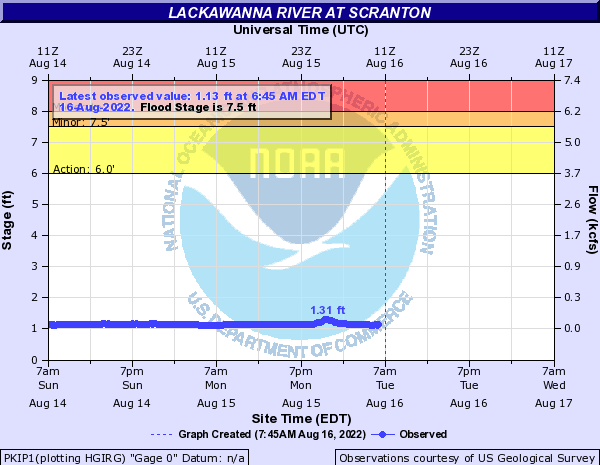 Embed a few Lackawanna river gauges from in and around Sranton, PA. Refresh page for current levels. More rain is expected in the area. Below is the expected rain fall amounts for Day 1-2. Stunning amounts of #rain this summer has left much of the Mid-Atlantic running 1 to 2 FEET above normal... just in the past 60 days!